A poll of 2,000 British adults conducted this week by the London Times found that one in three wants the Queen to abdicate within the next two years. 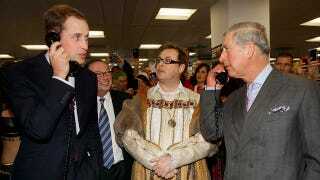 59% would like William to be crowned king, while only 41% would like to see Prince Charles take the throne. While William is certainly the more glamourous choice, we were under the impression that getting stuck with figureheads you don't necessarily enjoy was one of the hallmarks of monarchy.